If you're going to manufacturer medical handpieces for dentists, you must understand how to implement proper procedures to prevent rusting. In order to tackle various prevention tasks successfully, you must know how rust generates and the best prevention solutions for specific situations. The rusting process occurs when oxygen combines with iron elements. Once a metal corrodes, the iron and alloys will weaken. The main element that increases the corrosion process is water, which is a problem because it can easily access microscopic gaps that are found in metal handpieces. Because rust can make tools flaky and brittle, proper prevention steps must be taken when metal accessories are manufactured. Stainless steel is an ideal material to use for medical supplies since it contains 11 percent chromium, which doesn't rust easily. This substance creates a protective film that's made of chromium oxide, and this element acts like a shield that prevents rusting. 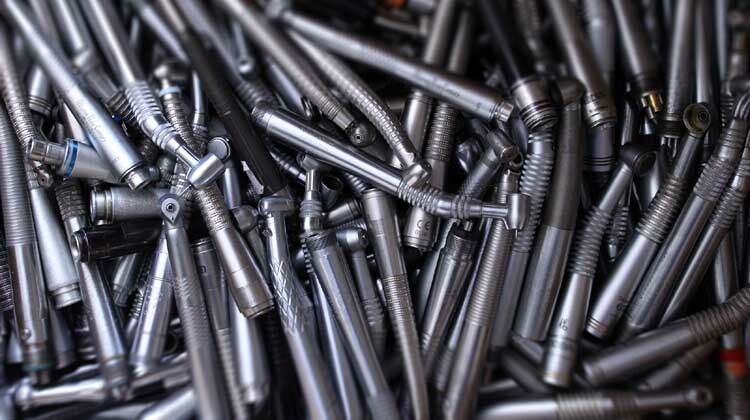 Weathering steel is another highly efficient metal that can be used during the handpiece manufacturing process, as it contains 21 percent alloying elements. Among these substances, the stronger elements are phosphorous, nickel, and copper, and they dramatically reduce how quickly corrosion occurs on steel. Galvanization is an effective way to stop rusting because a zinc coating is placed on vulnerable spots after the metal is dipped. Another benefit is that the zinc layer prevents the oxidation process by transferring harmful rust particles to the zinc coating. Bluing is a technique that can be used whenever small hand tools are manufactured. In order to use this technique, the metal components must be soaked in a solution that contains water, potassium nitrate, and sodium hydroxide. Organic coatings are cost-effective and can be used during strategic manufacturing situations. The process of applying the coating is easy because organic solutions cover metal like paint. Geek Upd8 - Tech Reporter: How To prevent Rusting? The rusting process occurs when oxygen combines with iron elements. Once a metal corrodes, the iron and alloys will weaken. The main element that increases the corrosion process is water, which is a problem because it can easily access microscopic gaps that are found in metal handpieces. Because rust can make tools flaky and brittle, proper prevention steps must be taken when metal accessories are manufactured.